Donation: Juggling and Circus Toys! 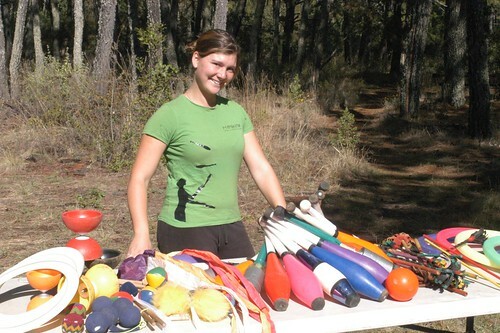 Judith was incredibly kind and donated to the Bosque a huge amount of circus equipment. 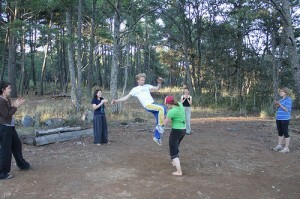 Judith volunteered here for 5 months and is very interested in all things circus. She led circus activities weekly and even more frequently helped people learn how to use the trapeze. Her donation will be shared among all the Bosque guests! Since December we have been fighting a plague in our pine trees. This has involved cutting down over 300 pine trees in the forest - for those who have been to the Bosque you will notice a big difference in the Dimple, the Mesa, and the entrance from the nearby village. 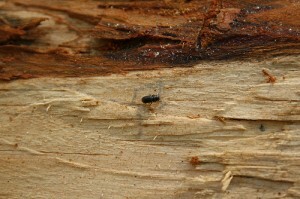 The beetles make their way under the bark to the cambium layer and lay their eggs. They eat the trees until they die, and then move to another tree. Different species of beetles are doing the same in many areas of North America. Ten years ago a nearby village lost an entire forest to this plague. To read more about this beetle, click here. We were so fortunate to begin our fight against the plague on the arrival of Angie, a certified Arborist and Forester. 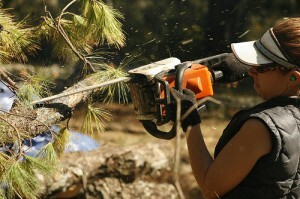 She took to the task right away and led large volunteer teams in cutting down infected trees and burning branches. We were also fortunate that the height of the battle took place during a spike in volunteer help - we had teams of 6 - 20 people working daily to clear out infected trees, tarp over piles of large infected branches, and burn the remaining branches. 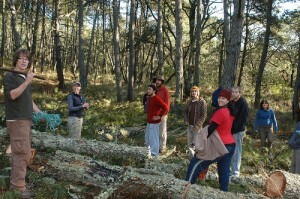 Below is the group during a short break from chopping up wood and cutting down trees. While watching parts of the forest getting chopped down was a bit unsettling since our primary objective is to protect and diversify the forest, there are many positive aspects to losing some trees. We’ve used our new sawmill to make beams that will allow us to construct new huts and buildings. We collected the sawdust to use in our cob mixture to make natural walls for the chicken coop and huts. We saved some large trees to carve more totem poles. And the new open spaces will allow us to plant a great diversity of trees and plants. This forest was clear-cut 60 years ago to be used for crops. According to a friend of the Bosque who knows some history of the land, the forest was naturally re-planted; it is mainly pines, oaks, and madrones. In the areas where we lost the pines, the oaks and madrones will find more space to grow and re-populate. We will supplement the diversity by planting fruit trees among the oaks and madrones. The fight against the pine beetle appears to be nearing the end. 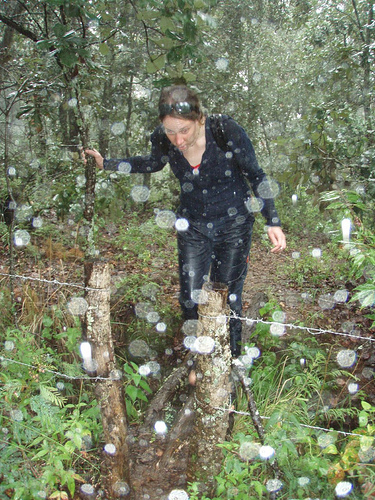 We will do weekly walks around the forest to look for infected areas. We are so grateful for our friends from nearby villages and our volunteers who helped us in this battle! Thanks for helping us save the forest. It seems the entire continent is getting hit with extremely strange weather. We had three days of constant rain, which is unheard of - we’re in the middle of our supposed dry season (though our longer term folks are beginning to doubt the validity of our dry season as it has been raining, a small amount, every few weeks or so). We found out important things, like in the two main buildings the roofs leak - in some cases, right over people’s beds. Our cisterns captured lots of water, which with more people in our system is definitely needed. The new cistern at Bliss Point, which was constructed after the rainy season this year, is 2/3 full. The plants are greener and happy. 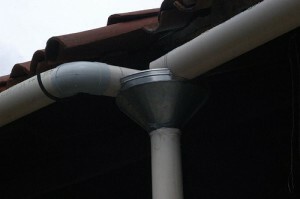 Below is a photo of one of our water capturing systems. The second day our volunteers came to work and we tried to be as productive as possible - making signs, doing computer work indoors, and making some paper-maché mask prototypes. 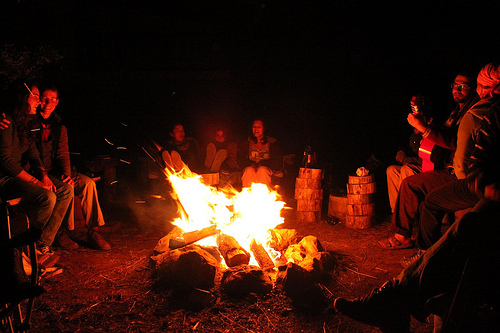 And the third day we decided not to try to work, and instead built fires, took saunas, tried to stay warm and dry. Yesterday the rain stopped! Sunshine! But… COLD. Everyone is wearing hats and lots of layers. We’ve had frost, which nearly never happens. And there was even ice in a wheelbarrow that was full of rain. We had some concern about the many small plants in the forest, but most should be ok because it wasn’t a deep freeze. Odd weather patterns in lots of places. 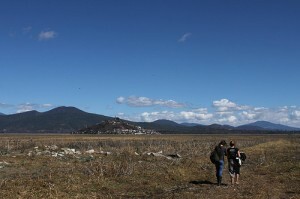 The place a few hours from us, Angangueo, where the monarch butterflies come in the winter got hit very badly - tornado even. Towns evacuated, and unfortunately some injuries and deaths due to mudslides and flooding. We are feeling lucky that all we got was monstrous weird rain. 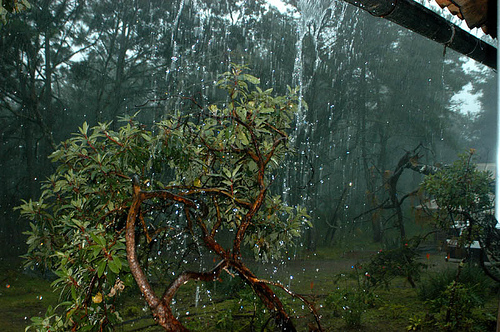 News reports do indicate that the rain has filled lots of reservoirs in Mexico City, which are a critical source of water for the city. Just like the results here; while the rain was unexpected and caused damage, the water we collected is very positive news. For those who are coming to visit soon - pack warm clothing! It is warm during the day but quite chilly at night, though we make lots of fires for warmth and fun. We are looking forward to many weeks of sunshine and warmth as winter comes to an end. You are currently browsing the News and thoughts from the Bosque Village weblog archives for February, 2010.